Found in northern coastal waters attached to rocky surfaces, they can be dislodged with a strong, sharp, metal instrument and opened by piercing the hinge. The heat of fire also causes the shell to open. The black–lip oyster is responsible for producing the black pearl. Black pearls: are naturally-coloured dark pearls from the black–lip oyster. Clings to rocks in coastal areas across northern Australia. They are very well camouflaged and need a sharp blow to dislodge their suction. Traditionally they would be roasted on hot coals for 5 minutes but they can also be boiled for 10 minutes. They are quite tough and chewy with a prawn like flavour. Like miniature clam shells, cockle shells are found around the coast in northern Australia in shallow reef areas. They are usually roasted on hot coals or boiled before being eaten. Found in rivers, streams and billabongs in north and eastern Australia. They are placed in a bucket of water overnight to allow the sand and grit to pass through. They can be eaten raw, boiled or roasted on hot ashes. Many varieties of this shellfish are found in Australia. In the east coast of far north Queensland they played an important role in the diet. Quite often caught with the use of the Lawyer Vine and other times by hand. The deeply ribbed Mangrove Snail is an important source of food for northern coastal areas. Boiled or roasted. Also they make excellent bait for line fishing. The Teredo Worm is found in rotting wood and logs of mangroves. Looks like a long thin worm but is actually a mollusc. Can be found at low tide and tastes like an oyster. Generally eaten as a tonic for general sickness. This photo of the worms was taken in South East Asia where they also flourish. It gives you can idea of what they look like. They are considered a delicacy! Mud crabs live in the mangrove lined shores and muddy estuaries of the Australian coastline from Broome in Western Australia along the top and down the east coast to around the Mid North Coast of New South Wales. 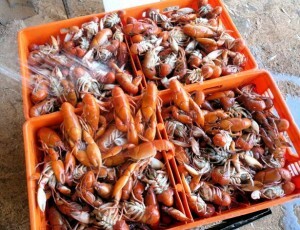 They are excellent eating, boiled or roasted. Embedded in the mud flats from the Kimberley, across the top and down the east coast to Brisbane, mussels are located with the feet or hands squishing down into the mud. Spiral shaped welks are found in similar areas to the Mud Mussel. The shell is roasted on hot coals before being broken open. Mud Whelks are large snails. They have a long, brown, spiral shell. Their shell can grow up to 11 cm in length. Found in the northern coastal waters and down the east coast they are best caught by diving underwater with a hand spear and catch them in crevices and under ledges. They do emit a piercing noise when caught which is designed to attract sharks so it is best to get them and yourself out of the water as quickly as possible. Cook in boiling water or roast them. On rocky surfaces around the northern coastal areas these oysters can be up to 5 cm long. Great eating either cooked or raw. A tray of Sydney Rock Oysters…. 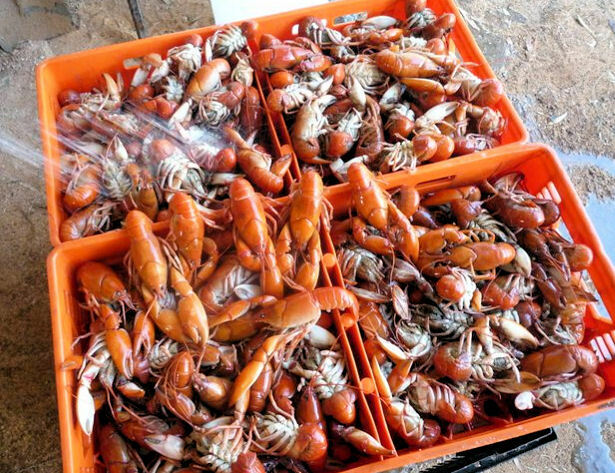 The freshwater yabby (as pictured here fresh from the Murray River in South Australia’s Riverland) is found in inland lagoons, billabongs, waterways and dams. usually caught by dangling red meat on a string in water or by tying red meat into a metal sieve-like bucket and waiting for the yabby to enter the trap. They make the best eating!! Fresh marron are the main attraction in Kangaroos Island’s Marron Café with an enticing range of marron menu options as well as steak, chicken and other dishes plus ‘specials’. Bush Tucker herbs, such as lemon myrtle, grown on the property are used in many meals and with marron provide that exclusive Australian experience and flavour.